Southern Dragon — Japanese Tier VII cruiser. A Ship Without a Country! Although the Southern Dragon is based on the Japanese Myoko-class vessels, the ship itself is a non-national ship. It's a ship of its own "Dragon" nation, and can be crewed by other IJN commanders. 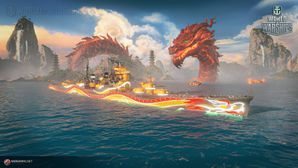 Southern Dragon performs exactly like the standard Myoko in the game (but without the ability to equip camouflage), and that means that she shares the same play style as the regular Myoko. You can refer to the article on Myoko for her performance appraisal. Visible to other players who have enabled the "Dragon" filter in their ship carousel. Japanese commanders can be trained on this ship- a versatile tier 7 premium. The Dragon Captain can take the helm of Japanese ships. As a special ship, Southern Dragon doesn't have any upgrades to research. As this is a Dragon ship, Southern Dragon cannot mount any camouflages. This page was last modified on 29 June 2018, at 13:36.